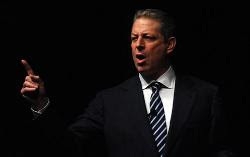 The case concerning allegations against Al Gore began in 2006, when an attorney representing the woman involved contacted the Portland Police Bureau. Detectives arranged to meet with the woman on three different occasions. All of these meetings were cancelled by the woman’s attorney. Detectives were then told by her attorney that the woman was pursuing civil litigation. The District Attorney was consulted, but without the woman’s cooperation, the case was cleared. In 2009, the woman involved asked Portland Police Detectives to take her statement. She read a prepared statement and a Detective asked follow-up questions. The Police Bureau did not contact Mr. Gore, nor did it refer the case to the District Attorney at that time. In June 2010, when a national tabloid published a story, the Police Bureau received public records requests for the police reports regarding these allegations. In accordance with public records law and because it was a closed investigation, the Police Bureau released those redacted reports. In reviewing this case, we have determined there were procedural issues with the 2009 investigation that merit re-opening the case. There should have been command level review at the time on the specifics of this case and decisions on whether the investigation should go forward. The decision to re-open the case was solely made by the Portland Police Bureau. It is our responsibility to both parties involved to conduct a thorough, fair and timely investigation. As with any open investigation, it is inappropriate for the Police Bureau to comment on any specifics regarding the investigation. We ask for the public’s patience as we let the facts of the investigation guide us and ensure the integrity of the investigation. I have asked Detectives to assign appropriate resources in the interest of conducting a complete investigation in an expedited manner. Did you notice anything interesting about the statement from chief Reese? His statement doesn’t name the specific allegation against Mr. Gore. Unless you have some prior information, you don’t know what this is about! COLORADO SPRINGS, Colo. -- The 45th class of the Air Force Academy in Colorado Springs graduated today under the cloud of several scandals first reported by 7NEWS. Reports that 57 female cadets were sexually assaulted between 1990 and 2003 led to removal of the superintendent and commandant last month. It looked like any other Air Force Academy graduation, caps tossed in the air, Thunderbirds screaming overhead. But the senior commanders who had led the 974 cadets through their last two years weren't present Wednesday, removed because of a sexual assault scandal at the school. Two senior cadets scheduled to graduate were omitted at the last minute. I am struck by the difference in tone between the two situations. Is this disparity “right and natural”?